Singapore's skyline was showered with a spectacular fireworks display as the 2015 SEA Games were officially opened in a joyful and colourful occasion at the newly-built National Stadium in Singapore. SINGAPORE: Singapore's skyline was showered with a spectacular fireworks display as the 2015 SEA Games were officially opened in a joyful and colourful occasion at the newly-built National Stadium in Singapore Sports Hub, tonight. The ceremony kicked off with a musical performance by Singapore's Armed Forces which formed the words 'SEA GAMES' before the city-state national anthem 'Majulah Singapura' was played following the arrival of Singapore President, Dr Tony Tan Keng Yam and his wife, Mary Chee Bee Kiang. The colourful and mesmerising cultural showcase combining the Malay, Chinese and Indian races involving almost 1,400 volunteers then took the centre stage which potrayed the uniqueness of the Republic's multi-racial society and also its flora and fauna. Nila, the official mascot for the games, was slowly brought to the 55,000-seater National Stadium's ground before the parade of athletes from 11 participating countries marched into the venue. 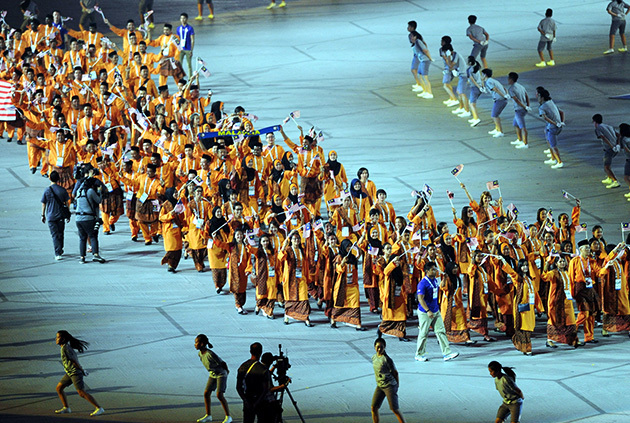 The Malaysian contingent led by chef-de-mission, Datuk Seri Mohamad Norza Zakaria and flag bearer, Leong Mun Yee (a women's diver), proudly entered the stadium with the male athletes wearing the yellow 'baju melayu' while the female athletes wore the yellow baju kurung with tiger stripes and the scarf covering their head. This was then followed by the speech from Singapore's Minister for Culture, Community and Youth, Lawrence Wong who is also the 2015 SEA Games Organising Committee Chairman before the SEA Games Federation (SGF) and also the games flag were raised. Singapore's netball player, Micky Lin and rugby player, Mohammad Azhar Yusoff jointly led the oath-taking ceremony followed by a 14-minute 3D with a shimmering LED light showcasing five different elements to reflect the games' theme 'Celebrate the Extraordinary'. The games torch was then jointly lit by Singaporean football legend, Fandi Ahmad and his son, footballer Irfan Fandi at Stadium Roar near the National Stadium before another sizzling fireworks display around Singapore Sports Hub wrapped up the momentous occasion. Also present at the event were Malaysia's Youth and Sports Minister Khairy Jamaluddin, Singapore President Lee Hsien Loong and his wife, Ho Ching; Singapore's cabinet ministers, the Sultan of Brunei Sultan Hassanal Bolkiah and wife Paduka Seri Baginda Raja Isteri Pengiran Anak Hajah Saleha. Almost 7,000 athletes of 11 participating countries will fight for the ultimate glory in the 36 sports of the biennial multi-sports event which will end on June 16. The competing countries are Brunei, Cambodia, Indonesia, Laos, Malaysia, the Philippines, Thailand, Timor Leste, Myanmar, Vietnam and also hosts Singapore. The Malaysian contingent comprising 909 athletes and officials would take part in archery, aquatics (swimming, syncronised swimming, diving and water polo), athletics, badminton, basketball, bowling, boxing, canoeing, cue sports (snooker and billiards), cycling and equestrian. They will also compete in football, fencing, floorball, golf, gymnastics, hockey, judo, netball, petanque, rowing, rugby, sailing, sepaktaktraw, shooting, silat, softball, squash, table tennis, taekwondo, tennis, triathlon, volleyball, water ski and wushu. Malaysia had already clinched a gold medal, a silver and also two bronze medals in the pre-opening of the games which got underway on May 29. The gold medal came from Katrina Ann Abdul Hadi and Lee Yhing Huey in the Duet Free Routine synchronized swimming; silver in syncronised swimming team event and also the bronze by Ho Ying/Lee Rou You in table tennis (women's doubles) and Yu Peng Kean in fencing (men's individual sabre). 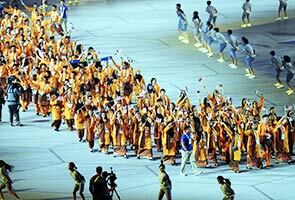 In the 2013 Games in Myanmar, Malaysia won 43 gold, 38 silver and 77 bronze medals to finish fifth. This is the fourth time that Singapore hosted the biennial games after three previous editions -- 1973, 1983 and 1993 and it was held in conjuction with their 50th anniversary as an independent nation.